If you've ever used a laptop touchpad, you already know exactly how to use iTeleport! Imagine your iPhone as a wireless touchpad -- that's iTeleport's innovative interface, which makes it a breeze to control your computer, and is much easier to use than any competing interface out there. The guide below explains how to perform common keyboard and mouse tasks such as clicking, scrolling, and typing when using iTeleport. Check out the new features page for new controls as they are added. For a demonstration of these commands, watch our videos! Tapping a modifier button once will apply the selected modifier to the next key press only. A double tap on any of the modifier buttons will change the icon's color to blue, and the selected modifier will remain active until the button is clicked again. 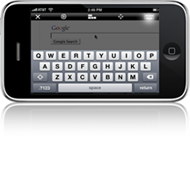 The Remote Menu allows quick access to a number of standard keys not accessible through the iPhone keyboard, as well as a numeric keypad. Additionally, the Remote Menu provides shortcuts to common functions such as copy/paste, close, quit, and the web browser 'back' button. To access more buttons within the Remote Menu, swipe the buttons to the left.